Happy Thanksgiving! Celebrate the 12 Days of Savings. FREE SHIPPING on all Jersey Boys Ticket orders of $100 or more! Valid Friday, November 23 to Tuesday, December 4. 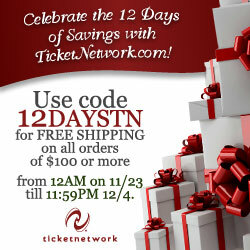 Simply enter code 12DAYSTN at checkout to receive free shipping! This free shipping code provides Jersey Boys Musical tickets for the shows of your choice, on your preferred date, in advance, from your home. Buy Jersey Boys Tickets Online, Use Code 12DAYSTN for FREE SHIPPING on all orders of $100 or more – Valid Friday, November 23 – Tuesday, December 4.